Figuring out where you are and where you’re going on the subway can be a challenge for anyone, but what if you weren’t able to see the station signs or read the maps to figure it all out? 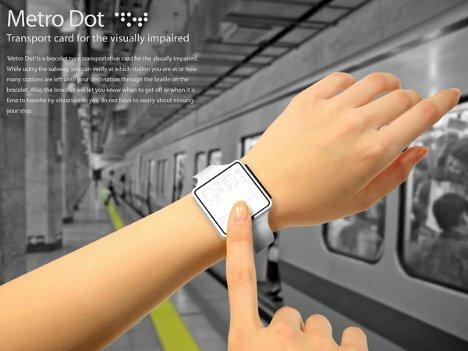 The Metro Dot is a conceptual product designed by Ho-Yeoul Lee, Jinwoo Kim and Sangyong Choi to help visually impaired people navigate the subway system. 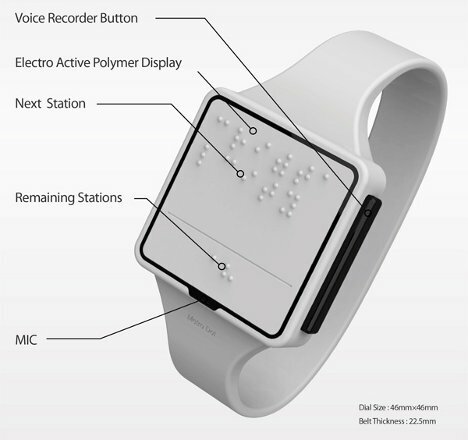 The bracelet-like device features a polymer plane that, just like magic, displays braille information to help keep the wearer informed about where she is on the train line. When entering the subway, the wearer checks in with the Metro Dot. This informs the bracelet of the wearer’s current location. The wearer then presses a small button on the side of the device and speaks her destination stop into the bracelet’s microphone. The information is then displayed on the polymer plane via a series of dots that raise up into the appropriate braille pattern. The passenger can verify her current location, destination and number of stops between here and there via both the braille screen and a series of vibrations. 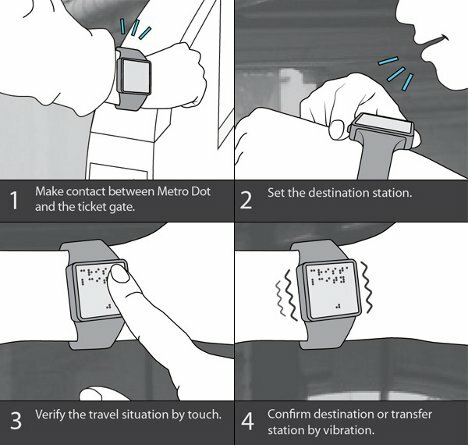 Once on the train, the bracelet vibrates to let the wearer know that the desired stop is coming up. 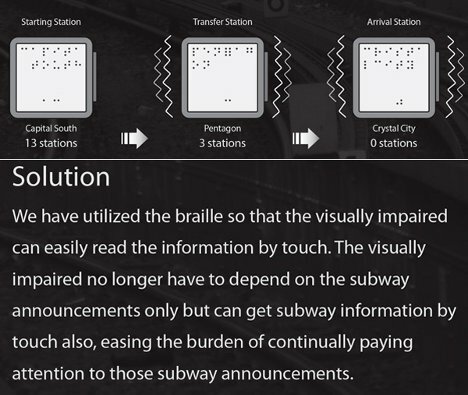 Then, rather than trying to decipher those impossible-to-understand announcements, the sight impaired passenger has an easy way to figure out where to disembark. See more in Various Gizmos or under Gadgets. July, 2012.